What is the origin of the Universe, what is it made of, and how does it change? Is there life in other planetary systems? How does the Earth system work, and how did life frst appear? What processes led to the formation of the Earth’s carbonaceous and metallogenic re- sources? How can earthquakes, volcanic eruptions and other geohazards be predicted? How will the climate change at the global and regional scale? What will be the impact of such change on hydrological systems and water resources? These are just some of the important issues addressed by the CNRS National Institute for Earth Sciences and Astronomy (INSU). The National Institute for Earth Sciences and Astronomy aims to design, promote and coordinate national and international research in the felds of astronomy and of solid Earth, continental surfaces and interfaces, ocean, atmospheric and space sciences. Working with other partner organizations and universities, the INSU carries out prospective scientifc studies in order to identify emerging research areas that require priority support. As part of the joint programs that it coordinates, the Institute funds research projects and sets up national and international facilities. The INSU also helps to structure national research in its own feld, in particular by managing the network of Observatoires des sciences de l’Univers (Earth Science and Astronomy Observatories-OSU). 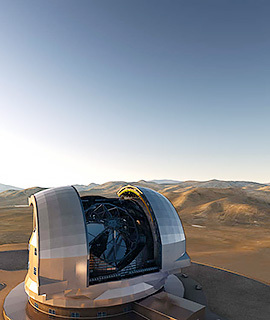 Artist’s impression of the E-ELT European Southern Observatory, ESO. Interaction of continental surfaces and the Critical Zone with the atmosphere and oceans, evolution of eco-hydrological systems and their quality, and weather-related hazards. The INSU approves and supports national long-term monitoring services in the Earth sciences and astronomy (observation of the atmosphere, ocean and land surface; earthquake and volcano monitoring; magnetic, geodetic and gravimetric monitoring ; contribution to the international atomic time; monitoring Earth-Sun relationships; observation of the Solar System and components of the Universe). The Institute coordinates and/or manages observation and experimental services for environmental research, as well as national and international infastructures (equipment platforms, oceanographic research vessels, aircraft and telescopes). Finally, the INSU develops high-performance computing necessary to operate, model, archive and give access to databases. The INSU coordinates strategic planning for European astronomy (ASTRONET) and collaborates in the development of European observation networks (RESIF-EPOS, ERA-MIN, ICOS, IAGOS, EMSO, etc). The Institute sets up and/or participates in international programs (MISTRALS, Argo, GEOTRACES, IODP). It manages large infrastructures together with European and international agencies, and designs instruments within the international consortiums that it often leads. With regard to research applications, the Institute contributes to operational forecasting services (Mercator Ocean for oceanography and PREV’AIR for air quality), which form an integral part of the European programme for the establishment of a European capacity for Earth observation, COPERNICUS. Its researchers take part in the Intergovernmental Panel on Climate Change (IPCC).